This reveal goes along with Falcom's plan to bring the entire Trails of Cold Steel tetralogy to the PlayStation 4 in their current fiscal year ending September 2018. After first releasing Trails of Cold Steel III in Japan on September 28, 2017, Falcom is going to release the PS4 versions of the first two games, Trails of Cold Steel I -Thors Military Academy 1204- and Trails of Cold Steel II -The Erebonian Civil War- on March 8 and April 26 respectively. 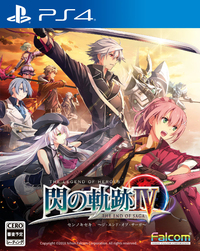 It is to be expected that the upcoming Trails of Cold Steel IV for PlayStation 4 should be released by September 2018. However, none of the Cold Steel titles for PS4 have had a Western localization announced as of yet.